Herkkumaa is still in the ownership of the founder, the family Rekola.The interest for the food industry seems to have been passed on in mother’s milk, as already the third generation has found a calling in the food sector. Herkkumaa was born in 1987 and focused from the outset on preserving cucumbers and beets following ambitious quality criteria. A strong desire to succeed and to create for the everyday life of Finnish families, better taste sensations from produced results. Although, at the time of the establishment of the company, there was intense competition in the area and standing out in the market was difficult. In spite of strong roots, the beginning is often difficult. In Herkkumaa, everybody clenched their teeth when in February of the year of the company’s founding, a severe frost wreaked havoc to factory pipes. It meant a big pipe renovation right at the outset, as well as poor cucumber harvests made the early stages difficult for the young company. The unremitting faith of Herkkumaa in their own taste nerves and in those of the other gourmets, as well as strict quality criteria, gave rise to products which have established their place at Finnish dining tables. 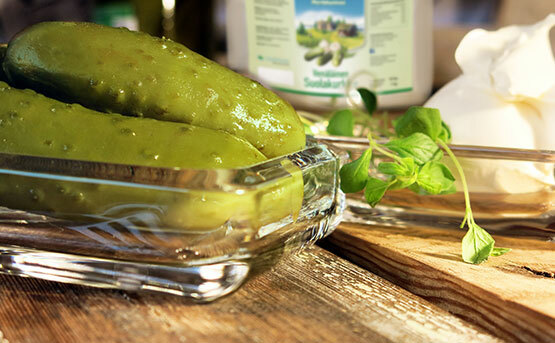 One of the most successful products of Herkkumaa is the pickled cucumber. The secret of its popularity is the fact that the pickled cucumbers of Herkkumaa are prepared in a self-made vinegar stock, which is seasoned with fresh blackcurrant leaves, crown dill and crushed garlic. From the very beginning of the journey of Herkkumaa, the juices have been part of a tasty product family. Within a few years after the establishment of the company, the family of products of Herkkumaa expanded to include jams and was completed over the years with a varied range of vegetable preserves, marmalades and condiment sauces.